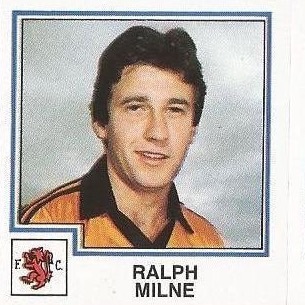 Ralph was a Dundee United 'S' signing from Dundee Celtic Boys Club in early 1976. By 1977-78 he was an established reserve player and turned out for the first team in a friendly against Alloa Athletic in August 1977. 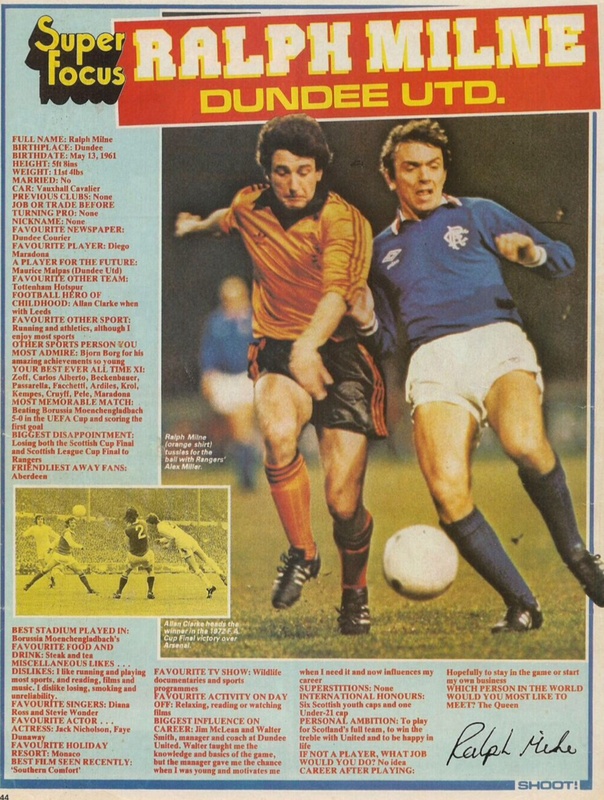 By the start of the 1979-80 season, the 18 year-old wide attacking player had pushed himself into first team contention, and after a scoring appearance in the Dryburgh Cup in July, he made his competitive debut in a League Cup match against Airdrie at Broomfield. A week later he came off the bench in a match at Celtic Park to earn United a 2-2 draw, and from then on his name appeared frequently in the line ups throughout that term. The League Cup successes of 1979 and 1980 came too early for Ralph, with manager Jim McLean going for a more experienced side, however he was involved in the Scottish Cup replay defeat against Rangers at the end of the 1980-81 season. Now firmly established in the first team, he began to make his mark on the European scene, with goals against Monaco, Borussia Mönchengladbach and Winterslag. He also put United in front in the 1981 League Cup final at Hampden with a typical Ralph Milne goal, but ended the match with another runners-up medal. His best season came in 1982-83, when his 16 league goals helped United win the Premier League championship. The goal he scored against Dundee in the final match of the league campaign at Dens Park is enough on its own to warrant his status as a Club legend. Just four minutes into the game he collected the ball just inside the Dundee half, he carried the ball forward skipping over a tackle, and delivered the most delightful chip high over the head of Colin Kelly and into the net from 25 yards. Ralph had a flare for scoring spectacular goals and always saved his best for the big stage in Europe. 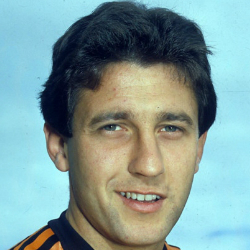 Playing in over 40 European matches, he holds the Dundee United record of 15 European goals, four of which he scored in the European Cup run to the semi final against AS Roma in 1983-84. In season 1984-85, he again collected runners-up medals in both the League Cup and Scottish Cup. 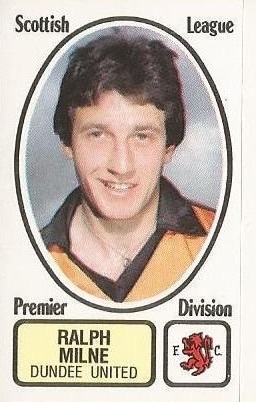 He played in the first six matches of the 1986/87 UEFA Cup, and helped get United's run to the final under way with his equaliser against RC Lens in the first round at Tannadice. However, with appearances decreasing and his fractious relationship with manager McLean becoming more and more troublesome, he left United at the end of January 1987 to join Charlton Athletic for a fee of £125,000. After a year at Charlton he moved on to to Bristol City, where a successful spell drew interest from other clubs and Alex Ferguson took him to Manchester United in November 1988. After a good start at Old Trafford, he eventually faded from the team and he spent some time on loan at West Ham United in 1989 before being released from Manchester United in 1991. He then moved to Hong Kong to join Sing Tao, but after a year he returned to Britain and retired at the age of 32. 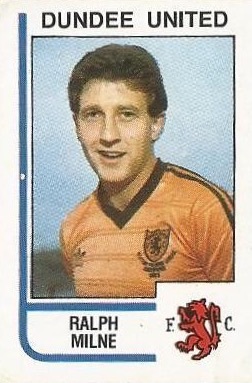 Capped at Under-18 and Under-21 levels, Ralph never quite made it to full international level, but is often included in lists of the best players never to have played for Scotland. 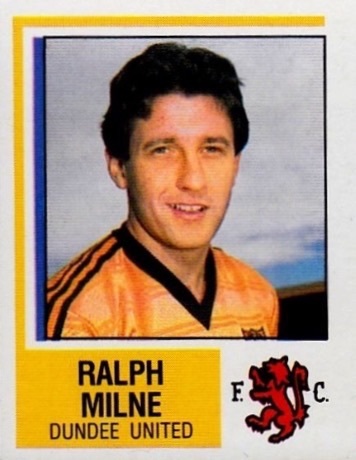 After a star studded United career lasting eight years, Milne will forever be idolised by United fans, and was inducted into the Dundee United Hall of Fame in January 2009. 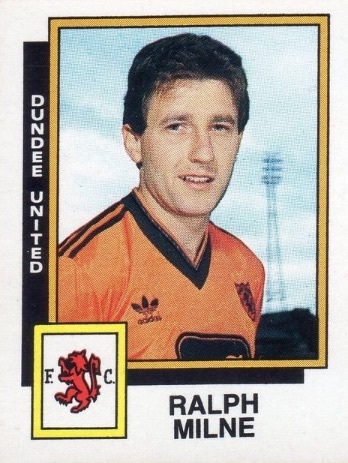 Ralph was born on this date in Dundee. A confident start by the Tannadice side who took advantage of a superb Frank Kopel opener in 19 minutes, to go on to win in convincing fashion. 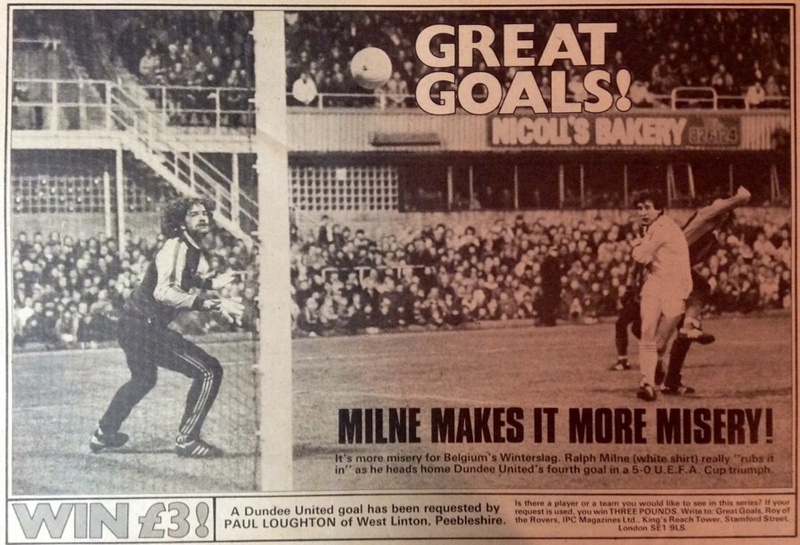 Paul Sturrock added a second eight minutes later and Ralph Milne, making his first-team debut, added the clincher after 63 minutes. R.C. Lens looked a better side at Tannadlce than in the first leg. Having said that their defensive formation threatened rarely. The best chance we created came when Ian Redford's dipping volley from 25 yards was touched on to the bar by Huard. Just before half-time there was a major scare when Billy Thomson averted disaster, flicking the ball for a corner, from which Carreno shot narrowly over. Fixtures following a European jaunt are always difficult and the trip to Kilbowie turned out to be just that. Iain Ferguson almost gave us a first minute lead, but his lob went over. Bankies hit back and Billy Thomson had to look lively from Christie, Gordon and Grant. It was, however, United, who opened the scoring. Kevin Gallacher won the ball on the right, slung over a cross to the far post which Eamonn Bannon headed powerfully past Gallacher. A mistake by John Clark allowed Gordon into equalise. Although we were on top for the rest of the half no further goals were forthcoming.